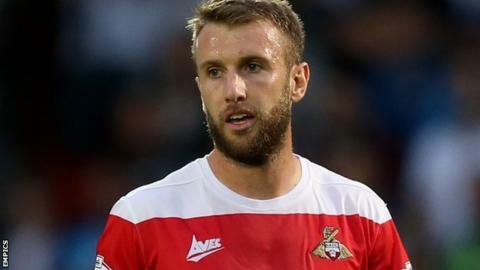 Striker Andy Williams scored twice for Doncaster as they secured victory at Oldham in League One. Williams grabbed the opener when he collected Craig Alcock's pass and fired into the top corner. After Latics midfielder Tim Dieng's header hit the bar, Williams scored his 12th of the season on the stroke of half-time after a goalmouth scramble. Rhys Murphy turned home Mark Yeates' cross late on as Oldham pushed but they failed to produce an equaliser. "I thought we controlled most of the game. "In terms of chances created, we were pretty good. "Once again we struggled and conceded two sloppy goals which isn't good enough for us. "I can't criticise the lads for the effort and passion they showed. They stayed in the game, they kept going and working until the last whistle but we found ourselves with too much to do again." Match ends, Oldham Athletic 1, Doncaster Rovers 2. Second Half ends, Oldham Athletic 1, Doncaster Rovers 2. Attempt missed. Rhys Murphy (Oldham Athletic) header from very close range is close, but misses the top right corner. Mark Yeates (Oldham Athletic) wins a free kick on the left wing. Goal! Oldham Athletic 1, Doncaster Rovers 2. Rhys Murphy (Oldham Athletic) right footed shot from the centre of the box to the top left corner. Assisted by Mark Yeates. Substitution, Doncaster Rovers. Richard Chaplow replaces James Coppinger. Substitution, Oldham Athletic. Joseph Mills replaces Richard Eckersley because of an injury. Richard Eckersley (Oldham Athletic) is shown the yellow card for a bad foul. Foul by Richard Eckersley (Oldham Athletic). Conor Grant (Doncaster Rovers) wins a free kick on the right wing. Mark Yeates (Oldham Athletic) has gone down, but that's a dive. Substitution, Oldham Athletic. Mark Yeates replaces Carl Winchester. Attempt missed. Rhys Murphy (Oldham Athletic) left footed shot from outside the box is too high. Corner, Oldham Athletic. Conceded by Harry Middleton. Attempt missed. Conor Grant (Doncaster Rovers) left footed shot from the right side of the box is close, but misses to the right. Jake Cassidy (Oldham Athletic) wins a free kick in the attacking half. Corner, Doncaster Rovers. Conceded by Brian Wilson. Attempt missed. Rhys Murphy (Oldham Athletic) header from the centre of the box misses to the left. Liam Kelly (Oldham Athletic) wins a free kick on the right wing. Second Half begins Oldham Athletic 0, Doncaster Rovers 2. Substitution, Oldham Athletic. Cameron Dummigan replaces James Wilson. First Half ends, Oldham Athletic 0, Doncaster Rovers 2.